One of my favorite things about blogging is the connections you make with other moms, bloggers and readers. There's something so amazingly fulfilling about bonding with another person over similar experiences, passions and challenges. I'm blessed to say that I have an amazingly encouraging and caring mommy blogging tribe, some of whom I text with daily (or 100 times a day) and feel so honored to be a part of a bigger circle of incredible women. 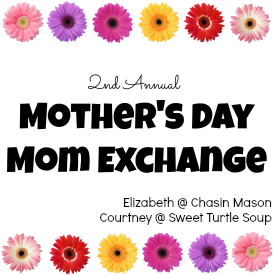 So, when Elizabeth and Courtney announced they were again hosting their Mother's Day gift exchange where we would get the chance to spoil another mom, I was so excited! I got matched with mommy-extraordinaire Tara from A Tale of Two Maples. I'd been reading Tara's blog for years until she took an unexpected break from blogging upon getting diagnosed with thyroid cancer this past August. She has the most positive and determined attitude and is an incredible mom to two adorable little boys. She's back blogging about her journey and family, so please head over to her blog and read along. Plus, check out what I sent her! I hope she likes it as much as I did! My other match was the absolutely adorable and incredibly sweet friend Amy of Keepin' Up With The Smiths. I've also been following Amy for a long time (since before we were both pregnant with our first) and I adore this girl and love reading about her and her adventures with her two gorgeous boys. Amy is so thoughtful and crafty and fun - she sent me the most amazing spa box, filled so all kinds of incredible items so I could create my own at home spa, including facial masks, a loofah, pomegranate bath bomb, candle, mani/pedi nail kit, nail polish, lip balm and (my very favorite item) salted caramel chocolates! Talk about being spoiled! Amy, you hit it out of the park! Thank you so much! I know what I'm going to be doing Sunday night! And special thanks to Liz and Courtney for organizing. Happy early Mother's Days to all the mommies out there! Oh my gosh, I need those salted caramel chocolates!!! And everything else she sent looks pretty fun, too! Have a great Mother's Day weekend, mama!! The revlon nail kit is adorable! I think I'm gonna have to go find that for myself! She sent you such a fun box, I bet a spa night is coming up soon! Super fun stuff! Happy Mother's Day to you! I hope it's fabulous! So, I completely forgot that I sent it in a Christmas box. Gosh! Happy Mother's Day, Mama! So glad you like your goodies! Amy did so good, but that doesn't surprise me one bit. :) Enjoy your spa night and have a really great Mother's Day!! A spa box is such a perfect idea! Happy Mother's Day! You hit the jackpot! I need to find those bathbombs do I don't have to go all the way to the galleria! That's so awesome! Amy hit it out of the park. Everything looks so perfect. Happy Mother's Day friend! This box is amazing!! What's better than a little pampering? Not a whole lot. Happy Mother's Day! Reading this really makes me want a diy spa day. Like right this minute ;) Great gifts and happy Mother's Day! Thank you for your sweet words, Sara! I truly LOVED my gift. Thank you so very much! Happiest of Mother's Day to you! Amy nailed it with the spa box. What a perfect idea!! Have the BEST Mother's Day!! What a fun idea!! Wish I had paid attention and joined in! Happy Mother's Day weekend mama!! I love Burt's Bees tinted lip balm...wear it daily! Have so much fun pampering yourself this weekend! Happy Mother's Day! I looove the spa box, how awesome is that! I hope you enjoy it all this weekend! Hello my name is salted caramel deliciousness! YUM. Salted caramel is seriously MY FAVORITE. And seriously what a great idea to send a whole spa box! Gosh I could use a day at the spa! I've been seeing those bath bombs in a lot of people's boxes, I might need to find one of those for myself! What amazing gifts! Happy Mother's Day! So many goodies!!! You were spoiled for sure! What a fun box!! Just perfect for those day you need a little pampering! Amy did great! Such fun things, and I love how she had a 'theme'. And nothing beats chocolate with salted caramel - YUM! You got some great goodies! I may need to try that delicious looking salted caramel bar. Yum! Mini bath ice cream?! Oh, that sounds amazing! This Mother's Day exchange looks so, so fun! I love getting little gifts in the mail. There is a blogger I am friends with and we always surprise each other with gift packages every so often!